The CR-600 vacuum sealing machine meets all clean room requirements! This impulse sealer is manufactured inside a clean booth and shipped after inspection. It is hermetically sealed and shipped only after the measured result is verified to be class 1000 or less. Shipment inspection points include using a device to measure cleanliness during sealer operation. The CR-600 impulse sealer comes standard with the ONPUL temperature-control system. 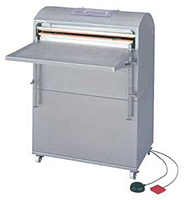 This impulse sealer also comes standard with a touch-screen LCD panel for optimal usage. A HEPA filter is an available option, to minimize particles in the exhaust air. Inside installed fan: 3 fans inside the machine body create airflow downward, so that all the particles inside the body cover and heating area are concentrated to the exhaust duct. Inside installed filter: Air filter for a vacuum pump is installed inside the machine body to decrease the unevenness of the body and make it compact. Exhaust fan: All the particles generated inside the machine body through the sealing operation are concentrated to the exhaust fan to be exhausted outside. Flange for the integrated exhaust duct: Set a duct to the flange so that all the particles concentrated through the exhaust fan are exhausted to the outside of a cleanroom. Easy touch panel display: Set values are displayed on touch panel display for easy understanding.